Over 40 years of HR experience to call on. Worked with organisations with 10 employees up to 10,000 employees. Managed all aspects of organisational change, from recruitment campaigns to TUPE tranfers to redundancy programmes. Sat on management boards to advise on all HR matters. Implemented good HR practice to ensure legal compliance. Experienced in dealing with staff issues such as long term sickness, timekeeping, discipline and absence. 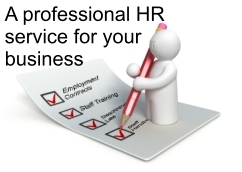 Advise you on HR legislation and good practice. Put together HR Policies and Procedures for your company. Assist you in managing staff issues. Carry out HR related tasks on your behalf.